Hi, Thank you friends and viewers. 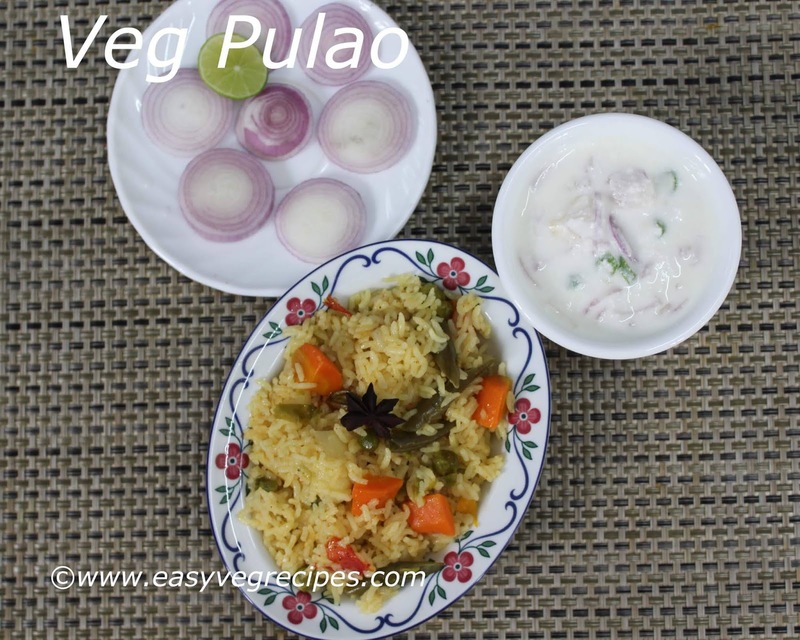 Today I will post how to make Veg Pulao Recipe. Veg pulao or vegetable pulao is an easy and simple recipe. This recipe can be prepared by beginners also. It's an easy recipe made with variety of vegetables and served hot. I have learned this recipe from my mom. It is another one pot recipe, can be made by bachelors also. You can check out for more one pot meals here. 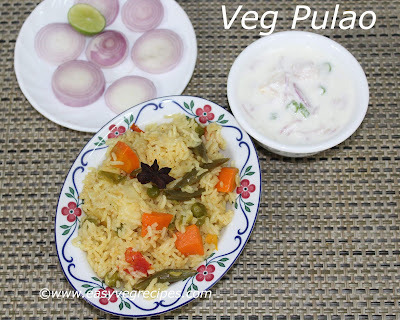 Veg Pulao -- Vegetable Pulao -- One pot meal made with mixed vegetables and rice. Wash and soak rice for one hour. Chop onions, tomatoes, and french beans. Cut potato and carrots into cubes. Slit green chillies. In a thick bottomed pan or pressure cooker, heat oil and ghee. Add whole masala, cloves, cinnamon stick, cardamom, star anice and bay leaf. When they start spluttering, add ginger garlic paste. Saute it well. Add chopped onions, once the onions become translucent add green peas. Saute them for a while, then add tomatoes and green chillies. Add in beans, potatoes and carrots also. Saute them well. Drain excess water from the soaked rice. Add the rice to the above vegetables. Add 1:2 ration, water, here I took 2 cups of rice so added 4 cups of water. Cover the cooker and cook for 2 whistles. Once the pressure goes off and cooker cools completely, open it and mix well. Put it again on the stove, if found any little moisture otherwise serve hot. Enjoy hot vegetable pulao with simple onion raita. Thank you for visiting my blog. Hope you like all my recipes. Feedback and comments are welcomed. For more rice recipes click here.